France, 2002, 100 minutes, Colour. 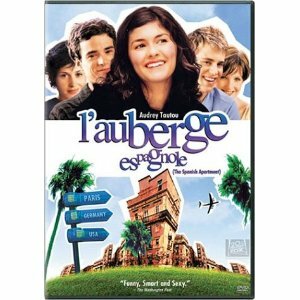 Romaine Duris, Judith Godreche, Audrey Tautou, Kelly Riley, Kevin Bishop. Euro Pudding is an entertaining comedy about young people on student exchange in Spain. The film focuses on Xavier (Romaine Duris) and his relationship with his exasperating hippy mother, his wanting to be an economist and work in a government company. The best way seems to go on an exchange - with some very funny collages of documents and bureaucracy for anybody to achieve anything. When he goes to Barcelona, he meets a married couple on the plane and they take him in. He then answers an advertisement and shares digs with a group of students from various countries of the European Union: Denmark, Germany, Italy, Britain, Spain and Belgium. The film shows Xavier's experience of studies (and Catalan's refusing to speak Castilian so that the international students could understand), his studies, his relationships, his falling in love with the wife of the doctor that he met on the plane, their affair, his covering for the various situations in which his fellow students find themselves, his inviting a friend to share the digs and discovering that she was lesbian. The film is a blend of the serious and the comic, more with the emphasis on the comic. It is designed to appeal very much to the younger generation that it portrays, the group that could identify with these experiences of rites of passage from student days to their careers and the rest of their lives. The film is also a strong endorsement of the benefits of the European Union and the different cultures of Europe sharing with one another. 1. A film about young Europeans for young Europeans at the beginning of the 21st century? The international mix? The shared ambitions? The formation of the European Union and its future? 2. Paris and Barcelona locations? Each city as a character in the film? The characters' comments about the cities, the sights, buildings, nature? The musical score and its range? 3. The title and its gathering these themes together? 4. The structure of the film: the focus on Xavier, his quest, going to Barcelona, the encounter with Ann- Sofie and her husband? The interview for the digs? The characters and the interactions? Relationships? Studies and ambitions? Growing up? The finale with Xavier reconciled with his mother, going to work, being given his office? His escape and going back to his writing - with which the film began? 5. The director's use of fast forward and time and motion with the beginning of the film, the plane's take-off, hurrying characters through corridors_. The comic tone? 6. The character of Xavier, seeing him writing, his voice-over commentary, at the beginning of the story, his ambitions, studies? The advice from his father's friend? His aggravation with his mother and telling her to shut up? The documentation for the Erasmus scheme and the satire on bureaucracy? His flight, the farewell to Martine, the relationship with her? Her not wanting him to go? The airport? Crying on the plane with Ann- Sofie and her husband, offer of friendship? His accommodation and its falling through? The humour of the interview - with the various nationalities exhibiting their stereotypes? His being accepted and wanting it? Moving in, making his room his own? The bonds between him and each of the people there? His lectures, the complaints about the lecturer speaking only in Catalan? Going out at night, enjoying himself? The emotional complications in the apartment? His inviting Isobel in, discovering she was a lesbian, her relationships? The other characters and their responses to one another? His growing friendship with Wendy, going out with her, her brother's arrival and his mocking the stereotypes? Wendy and her relationship with the American? Martine's visit and its failure, her criticisms of the apartment? His going back to Paris for the day, the break-up with Martine, continued exasperation with his mother? Their all combining to save Wendy's reputation from her boyfriend? The farewell party? His affair with Ann- Sofie, his deception of her husband, going to him for the tests? His discussion of the brain? Their all coming to the farewell party? His return home, his mother, reconciliation? The job - too plain? Going to write his novel? A rounded portrait of a young Frenchman? 7. The other characters and their characteristics: the meticulous German, the Danish man - and the discovery of his girlfriend and the baby? The fiery Spaniard? The Italian? His untidiness? Contrasting with the German? Isobel and her place in the apartment, the lesbian relationship, her support of Xavier? Wendy and her organising people, being tidy? Not speaking French? Her brother and his performances, irritating everyone? The night out, the singing and the drinking, his being sick? Wendy and Alistair's arrival with her being in bed with the American? Everybody rushing back, the pretence with the keys, defending her? William being a good sport and getting into bed with the American boyfriend and saving the day? 8. The contemporary generation of Europe at the beginning of the 21st century? Their heritage, their coming of age, their training, their hopes? The future generation of Europe?